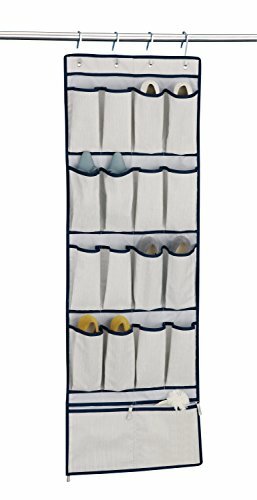 The Organize It All 16 Overdoor Shoe Bag is a stylish storage bag with zipper pockets made of heavyweight 600D denier polyester in a light grey with blue accent color. It protects your shoes from dirt and dust but it's not just for shoes, you can store your gloves, mittens, scarves, sandals, or put in a hallway closet and store other home items. The Swivel Design that allows you to hang over your door or in your closet. FootFitter Italian Flannel Cotton Shoe Bag, 10" x 15" - 4 Pack!